A 19" network cabinet that combines versatility and strength with easy-to-use features. I am interested in one of the products on the Ausrack Plus Network page of your website. Ausrack Plus Network is designed to accommodate medium to large passive patching networks and active communications equipment. By the use of cable zones and cable management systems, tailored, structured cable management solutions can be incorporated to suit any network application. 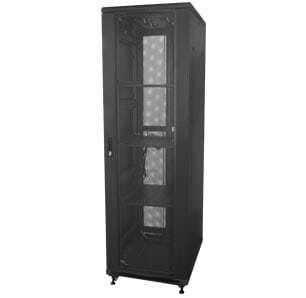 Designed for data centre applications and can easily be bayed to other cabinets or racks. A front perspex and rear steel door are included however there are many door and side panel options which can be included by designing your solution from an Ausrack Plus Frame. YourDC needed a modular server rack design with cold aisle containment that could easily be replicated across multiple rooms in their new state of the art data centre in Adelaide, SA. The Gold Coast University Hospital project demanded a secure and innovative IT infrastructure solution to manage sensitive patient information and ensure peace of mind. The $2 billion Fiona Stanley Hospital in Western Australia required a complete data cabinet and equipment solution. This new state-of-art facility provides unparalleled levels of accessible, integrated and evidence-based patient-centric care.